Superstition and folktales are known to link Owls and bad omens. In some parts of the world, spikes are even placed on the roofs of rural houses to prevent owls from landing there. The eerie call of an owl at night still fills some people with the sense of foreboding that death is imminent or something evil is at hand. In early Roman times a dead owl nailed to your door averted all evil. Early English folklore believed that owl eggs cooked to ashes could improve eyesight and a broth made from owl could cure whooping cough. Even today, owls are used in traditional medicine because of the owls perceived wisdom, remarkable eyesight and hunting skills. But we can safely say that all of these superstitions are nonsense, and those who believe them are missing out on the incredible nature of the Owl. These majestic birds are such a special sighting in the Kruger and they don’t deserve the treatment they get from old wives tales! Although the Owl has huge eyes that see remarkably well at night it mostly relies on its exceptional hearing to catch prey. Being nocturnal hunters, owls can be seen by day perched high up in a tree, avoiding sunlight and resting before the nights hunt. Owls hunt in rocky hills, woodlands and riverine forest areas, where they can easily find prey. Although the Owl has huge eyes that see remarkably well at night it mostly relies on its exceptional hearing to catch prey. Being nocturnal hunters, owls can be seen by day perched high up in a tree, avoiding sunlight and resting before the night’s hunt. Owls hunt in rocky hills, woodlands and riverine forest areas, where they can easily find prey. The two most common Owls found in the Kruger National Park are the Barn Owl and the Verreaux’s Eagle Owl. The Barn Owl has earned the nickname “Ghost Owl”, because of its eerie “Screeech” made while flying at night, its ghostly appearance and the fact that it likes to roost in abandoned buildings. The adult Barn Owl is about 30-36cm in height and weighs roughly 410g. With a wingspan of 90cm, this medium sized owl has a golden buff and a pale colouring. Black eyes are seen in a very distinctive heart shaped face. 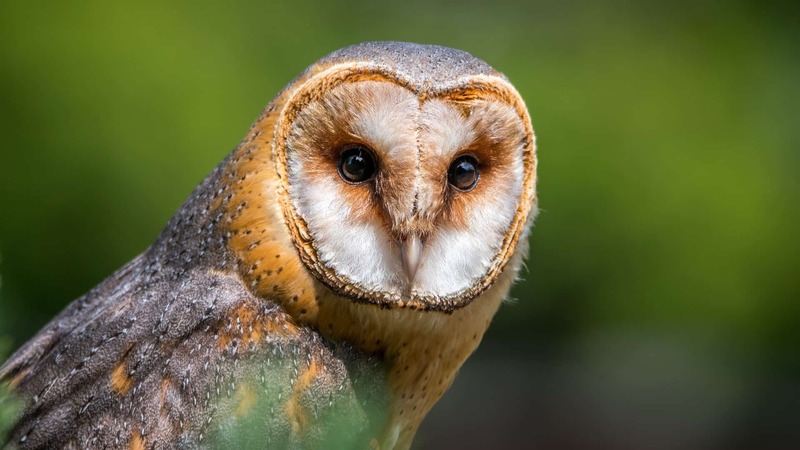 Barn Owls prey on lizards, birds and frogs but their main source of food is rodents. These Owls live easily where humans are present and often nest in barns or close the human settlements. In the Kruger National Park, they are often found nesting close to rest camps. Owls hunt from dusk, as raptors will hunt owls if they can find them during the day. Barn Owls breed from March to May and lay 5 or 6 eggs in a simple depression. After about 33 days the eggs will hatch and the young owls will be ready to leave the nest after about 70 days. Barn Owls usually mate for life. An Adult Verreaux’s Eagle Owl is larger than a Barn Owl. It measures about 58 to 66 cm and can weigh anything from 1.5 to 2.4 kg. Having a wingspan of 1.50m, this is a large owl, with very noticeable ear tufts. 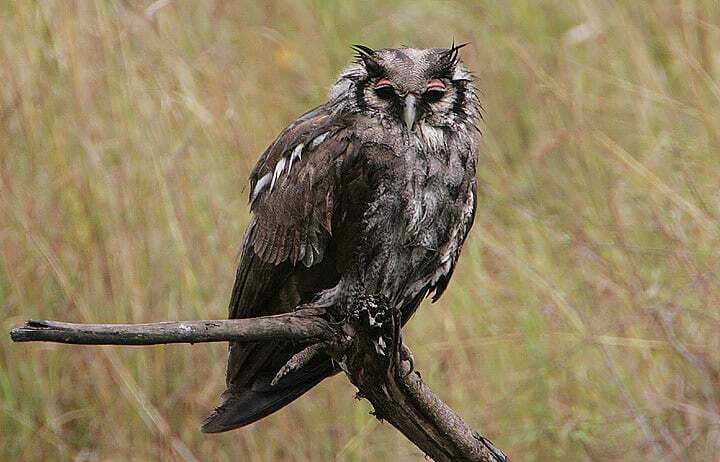 Verreaux’s Eagle Owls have dark eyes and pink eyelids with a grey beak and a black rimmed pale face. The preferred habitat of the Verreaux’s Eagle Owl is in woodlands and savannah areas, often in large trees. These Owls hunt in the same areas as eagles and falcons but can happily co-exist with these raptors because they are nocturnal. This Owl has a diverse diet and will hunt rodents, birds where they roosting for the night and even prey as large as a vervet monkey or a mongoose. The Verreaux’s Eagle Owl also eats insects and bats. While perched high in a tree the Owl will spot its prey and swoop down with wings that are virtually silent, slamming its huge sharp talons into the prey, resulting in instant death. Verreaux’s Eagle-Owls usually use the same nest year after year. They breed from March to September and normally have two eggs. After about 39 days the eggs hatch and after three months the chicks are ready to fly. It is rare that both chicks survive. It is thought that the stronger one will dominate and in the end, the weaker owl will die. Although the surviving chick can fly at three months, it generally stays with the adults until the next breeding season. Verreaux’s Eagle-Owls are not known to breed every year. Whether you are staying in the park during your Kruger Park safari trip, or should you be staying nearby, chances are good that if you wake during the night, you’ll hear the call of the Owl, and it is in no way as sinister as superstitions of long ago would have you believe!